As satisfying as The Force Awakens was, as the dust settled, it became clear J.J. Abrams had just remixed A New Hope for a new generation, without any new ideas. Heck, he even opted for another Death Star — that most cumbersome of weapons. So concerns that The Last Jedi might end up being another Empire Strikes Back weren’t unfounded. Of course, Abrams didn’t direct The Last Jedi. That job went to Rian Johnson, the writer/director behind the brainy indies Brick, Looper and The Brothers Bloom. A self-described fan of the franchise, Johnson explores corners of the Star Wars universe never seen before — chief among them, a scenario beyond the standard battle between good and evil that has characterized the saga. He also takes full advantage of the visual possibilities to deliver the most unique-looking episode of the series, without becoming a CGI hodge-podge like the prequels. I won’t spoil the plot. Suffice to say, the Resistance is in shambles. Even without a massive, impractical weapon able to destroy planets, the Empire’s strength is overwhelming. Not everything is perfect, though, as Kylo Ren (Adam Driver) has fallen out of favour with Supreme Leader Snoke following his defeat by Rey (Daisy Ridley). The rebels also face internal conflict. With General Hux (Domhnall Gleeson) breathing down their necks, Leia (Carrie Fisher) and Poe (Oscar Isaac) can’t agree on the best way to avoid annihilation. Meanwhile, Rey struggles to get Luke Skywalker (Mark Hamill) to rejoin the fray. The Jedi knight is not over the events that led to Kylo Ren switching teams and is not inclined to go through the same motions with another gifted, unruly student. 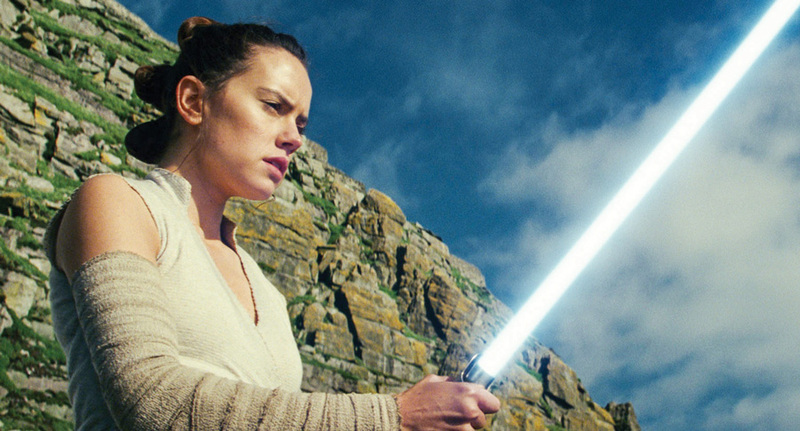 Unlike previous installments, The Last Jedi relies heavily on the performers and boy, they deliver. Maybe it’s because of the goodwill generated by her untimely death, but Carrie Fisher is phenomenal as Leia. The Resistance leader is clearly burdened by the casualties being suffered, but her resolve is unshakeable. Mark Hamill is asked to bridge his brash younger self with a cautious, misanthropic older Luke and pulls it off. Of the new generation, Adam Driver is the MVP. More comfortable in Kylo Ren’s skin than the first time out, he makes the character’s tortuous journey believable, even relatable. The movie goes out of its way to present Rey and Kylo as two sides of the same coin. They may be in opposite corners, but they recognize in each other a kindred spirit, a connection that pays off tenfold. There are several of these dichotomies peppered through the film, which serve to explore the nature of power, the darkness inside us all, and the divide between generations. The Last Jedi has a conflicted relationship with the Star Wars canon. There is a desire to break with it, but at the same time, an acknowledgement of its tremendous power. The tension that comes from these opposing forces serves the movie well — especially in a spectacular third act. The quality of the space battles has improved exponentially. Rian Johnson, who has already been tapped for a new trilogy set in the Star Wars universe, brings new elements to skirmishes between rebels and the Empire. The opening dogfight is one for the ages. Overall, this is a profoundly satisfying episode. Sure, it’s a notch disjointed, but nothing unbearable. There’s plenty of humour too. But the plot development and related themes are pretty heavy, so it isn’t a “happy” movie. And everything related to Leia is emotionally charged, right down to the credits. The Last Jedi presents a question that has escaped every other Star Wars installment: who benefits from the conflict between the Empire and the Resistance? The answer is as pedestrian as it is topical, and has the potential to blow the franchise wide open.